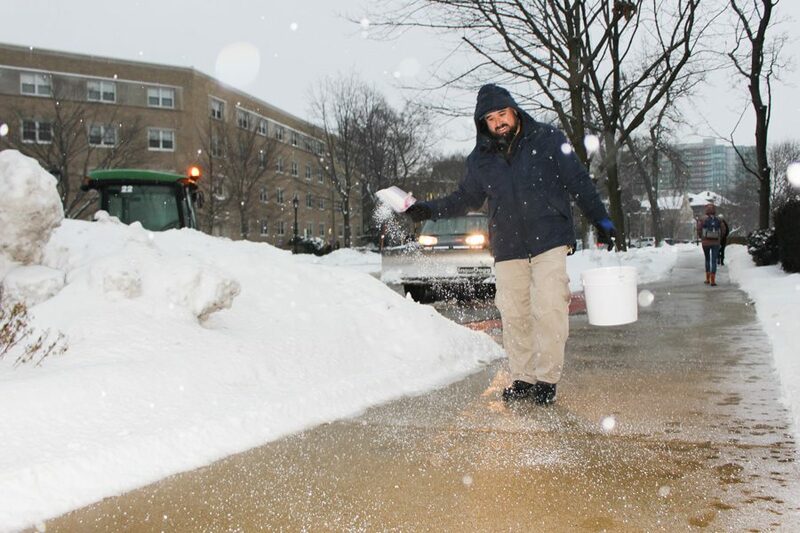 University groundskeeper Marco Montoya spreads salt on south campus. Despite increased clearing efforts, multiple students have reported injuries related to the icy conditions of campus walkways. As a new round of midterms begins, Northwestern students are worried more about falling than failing. Across campus, students are slipping, tripping and falling off bikes due to icy sidewalks that don’t thaw despite the University’s extensive clearing efforts. Some students are concerned the slippery conditions are making their commutes dangerous. Weinberg sophomore Anna Hornbacher said she suffered a “brutal” concussion last week after slipping on ice while walking to class. She said she was walking outside Fisk Hall when she fell and hit her head on the concrete. After feeling dizzy and nauseous, she went to University Health Services, where they diagnosed her with a minor concussion and arranged for her to work with an athletic trainer. Hornbacher said she had to take time off from class due to her injury. Although her teachers have been understanding, she said it has been difficult to “drop everything.” Hornbacher is now beginning to return to classes and responsibilities. Students are at risk because the University hasn’t done enough to clear its walkways, Hornbacher said. “Northwestern needs to take into account the well-being of its students,” she said. Although the solution may seem as easy as simply throwing down more salt, NU is taking comprehensive measures to address the slippery roads, said University spokesman Bob Rowley. To create safe conditions on campus, NU teams up with contracted workers to respond to snow and ice, using shovels, boom tractors and plows to clear the paths, he said. The goal is to physically remove the snow before relying on the use of salt, he added. In instances of continuous snowfall, the facilities department prioritizes the most heavily used parts of campus and addresses them in rotation. Often crews are forced to re-clear each area hourly to keep up with the new snow. Marco Montoya has worked as a groundskeeper at Northwestern University for the past 18 years and has witnessed the University shut down in 2011 and 2014 due to cold weather. For the past two weeks, Montoya said he and his crew have worked without a day off, clearing snow and ice from campus sidewalks to keep students safe. He says he is not sure when his crew will be allowed to go home. Montoya also advised students and faculty to stay indoors as much as possible, as the dangerously low temperatures will inevitably lead to icy conditions. Weinberg junior Andrew Bowen said he has slipped multiple times while working as a University tour guide. Recently, he posted a meme on the Northwestern Memes for Networking Teens Facebook page to vent about the icy conditions. The post now has over 1,000 likes and has inspired similar comments and commiseration. “I guess it struck a chord,” Bowen said. Hornbacher said she appreciates posts like Bowen’s that bring people together. Seeing other students’ struggles on Facebook has helped her feel more supported.